We have a very Awesome Package that include a DVD. It is extremely easy to grow, you can literally grow as large scale as you want to grow, because it is a living culture it continue to grow. The Spirulina dvd that is included has 2 very easy to follow A TO Z for Spirulina Home growing and commercial growing. But the formula is so easy and you can make it yourself. It is very economical to keep. It hardly coast you anything. On the DVD full colour Manuals with all the formulas and mixes a lot of options on how to grow even organic mixes, you can choose the one that will work for you. What is Spirulina Platensis ! ! Spirulina is a cyanobacterium (blue-green algae) that can be consumed by humans and other animals. There are two species, Arthrospira platensis and Arthrospira maxima. Arthrospira is cultivated worldwide; used as a dietary supplement as well as a whole food; and is also available in tablet, flake and powder form. Spirulina was once classified as a plant because of "its richness in plant pigments as well as its ability of photosynthesis," according to a study published in the journal Cardiovascular Therapeutics. New understanding of its genetics, physiology and biochemical properties caused scientists to move it to the bacteria kingdom, in the genus Arthrospira at first, and later into the genus Spirulina. There are several species, but three — Spirulina platensis, Spirulina maxima and Spirulina fusiformis — are studied extensively because of their high nutritional as well as potential therapeutic values, according to the study's authors. Spirulina grows in microscopic spirals, which tend to stick together, making it easy to harvest. It has an intense blue-green color, but a relatively mild taste. Aside from supplements, the U.S. Food and Drug Administration (FDA) allows manufacturers to use Spirulina as a color additive in gum, candy and other packaged foods. Spirulina is said to help a range of eclectic health problems, including premenstrual symptoms and amyotrophic lateral sclerosis (Lou Gehrig's disease), according to the NIH. A combination of zinc and Spirulina may help the body clear arsenic in people whose drinking water has unusually high levels, according to the NIH. Antioxidants are compounds that help combat cell and DNA damage that leads to cancer, heart disease and other chronic diseases. The body makes some antioxidants, and others are found in food. Despite the presumed benefits of taking extra antioxidants, extensive research has not shown that taking antioxidant supplements lowers cancer risk, according to the National Cancer Institute. Taking antioxidant supplements likely won't help other diseases such as diabetes, according to a 2011 abstract published in the journal Current Diabetes Reviews. Although antioxidant supplements have failed to stave off disease in studies, it may be "that the lack of benefit in clinical studies can be explained by differences in the effects of the tested antioxidants when they are consumed as purified chemicals as opposed to when they are consumed in foods, which contain complex mixtures of antioxidants, vitamins, and minerals," according to the National Cancer Institute. Since Spirulina is considered a food, it remains an open question as to whether dried Spirulina in supplements has antioxidant health benefits. 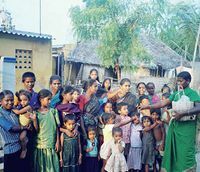 One preliminary study of Spirulina's antioxidant effects tested the supplement on 87 people in Kerala, India, who regularly chewed paan tobacco. Paan is prepared from the leaf of the betel tree and various spices, and is typically chewed after meals and ceremonies such as weddings and receptions. Paan tobacco chewers are at increased risk of an oral cancer called oral leukoplakia. Over the course of one year, 45 percent of the tobacco users who took daily Spirulina supplements saw a complete regression of lesions. Just 7 percent of people in the placebo group saw a complete regression in tumors in the same period, according to the 1995 abstract published in the journal Nutrition and Cancer. Antioxidants may help athletes recover from exercise-induced oxidative stress that contributes to muscle fatigue – and Spirulinahappens to contain several compounds shown to have antioxidant properties, including phenolic compounds, phycocyanins, tocopherols and beta-carotene, according to a 2010 study published in Medicine & Science in Sports & Exercise. Researchers in the study investigated Spirulina's possible exercise benefits among nine male recreational runners over four weeks. They found the runners showed a greater increase in exercise performance and levels of antioxidants after taking Spirulina than they did when taking no supplements or taking a placebo. Although these preliminary findings are promising, they are too small to draw a conclusion about Spirulina's effect on exercise fatigue, according to the study's authors. Several research studies looking into Spirulina's effects on cholesterol and triglycerides (or hypolipidemic effects) have found Spirulina to be beneficial. However, most human trials investigating these effects have been limited to studies of fewer than 100 people, and many did not have a control group of people taking a placebo. 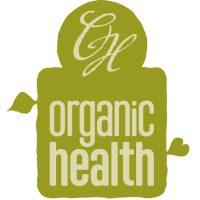 One 2008 study tested Spirulina's lipid-lowering effects on 78 adults, ages 60 and 87. The volunteers took 8 grams of Spirulina supplements, or a placebo, a day for 16 weeks. At the end of the study, there were significant reductions in cholesterol among those who were treated, according to the abstract published in Annals of Nutrition and Metabolism. Another study of 52 adults, ages 37 to 61, examined Spirulina's effects on people recently found to have high cholesterol. Study participants took 1 gram of Spirulinasupplements a day for 12 weeks, and gave fasting blood samples at the beginning and end of the study. By the end of the experiment, average levels of triglycerides, total cholesterol and the potentially harmful LDL (low-density lipoprotein) cholesterol decreased. However, blood pressure, weight and body mass index readings did not change, according to the July 2013 paper published in the Journal of the Science of Food and Agriculture. Doctors now recognize that heart disease is not just a disorder of high cholesterol and triglycerides, but also a chronic inflammatory disease, according to a July 2010 review of Spirulina's hypolipidemic effects published in the journal Cardiovascular Therapeutics. Spirulina may then help manage and prevent heart disease through antioxidant properties, however more study is needed. Extruded spirulina laid out to dry. Large Scale: If produced industrially: In green houses, large water tanks (raceway ponds), water, fertilizer, pump/ paddle wheel to move it. Air compressor, such as aquarium ones. 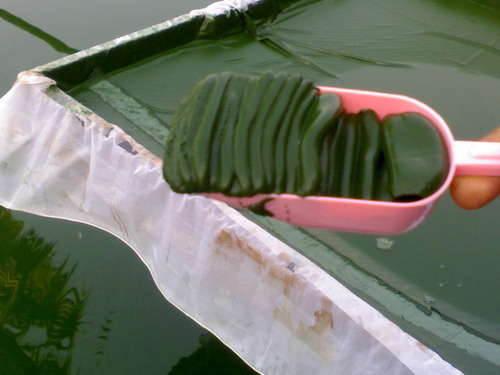 A concentrated spirulina culture is then used to seed the pond containing culture medium. This can be obtained from culture floating on an existing pond, or recently harvested. This is mixed into the culture medium and allowed to grow. It should be regularly agitated using an electric pump or by stirring manually. 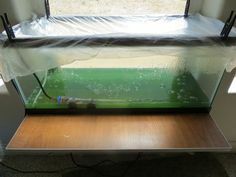 The temperature, pH and concentration of algae should be monitored. Once the concentration increases to about 0.5g/L (use a Secchi disk to measure) it must be harvested. This can be done by simply filtering it through a cloth to obtain a “biomass” of about 10% dry matter per litre. The biomass obtained is then pressed in a cloth to produce a kind of cake. 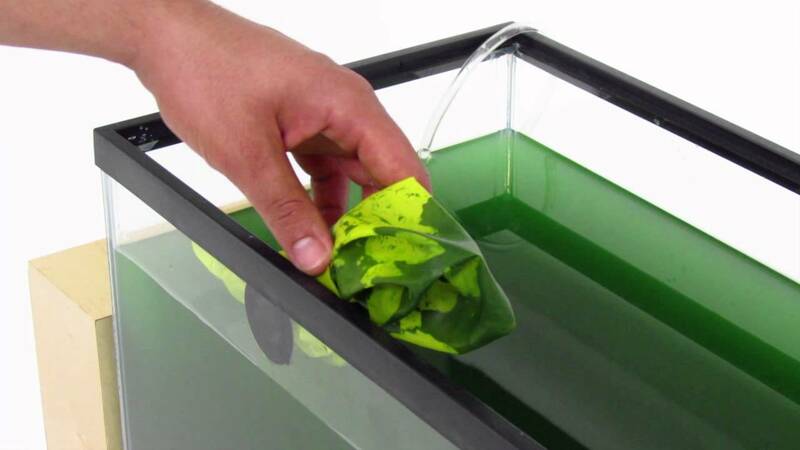 The culture medium can then be reused, by adding any of the ingredients which were used up by the Spirulina. Spirulina is most nutritious in its wet form. However this lasts at most for a few days if refrigerated, and only a few hours at room temperature. Hence if it needs to be transported or stored it must be dried. If dried and packaged well it can be stored for at least a year without losing nutritional value. However if dried it acquires an unpleasant smell and taste, and is inconvenient to use. It can then also be combined with various other food products or simply packaged on its own. The production of Spirulina requires manufacturing of a tank. The size of this depends on the scale of production, and the number of tanks. 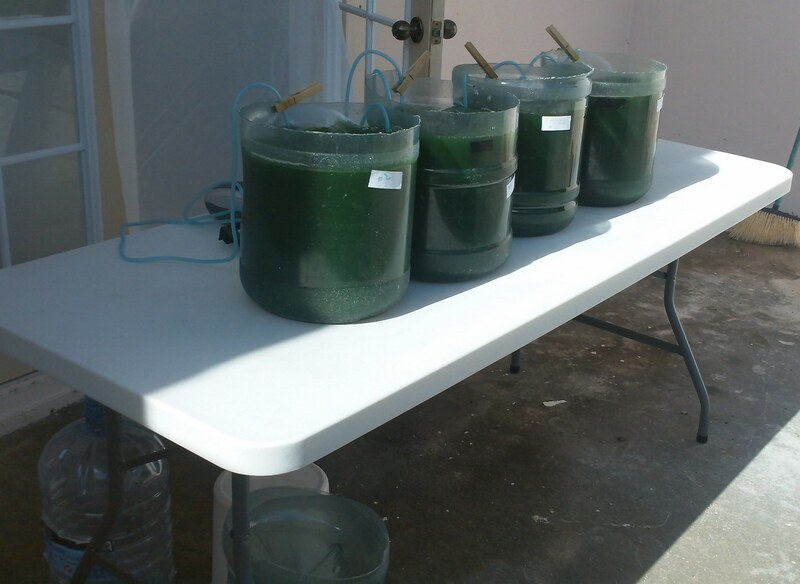 1 tank of 18m2 produces approximately 150g of Spirulina per day. 2 polyethylene sheets 2mm thick. Build up the walls, approximately 30cm high with packed earth, bricks or planks. The material to be used depends on the weather conditions, and presence of rodents, termites etc. Cover the sides and the bottom with one polyethylene sheet. 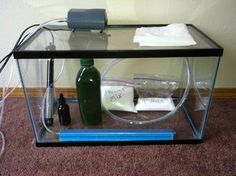 Create a temporary compartment (200L) to produce Spirulina needed to seed the whole tank. Reinforce the walls with metal/bamboo frames and cover with a second plastic sheet. The culture medium and tanks need to be protected from contamination by foreign algae, insects and toxicity. Also the level of the pond and amount of nutrients needs to be maintained by regularly replacing the fertilizers and water. Further the temperature and pH need to be maintained. Details on how this is done can be found in the manual. It is useful to replace a small amount of the solution with a completely fresh amount, to prevent deterioration of the culture medium. Further, tanks usually need to be replaced or repaired after 3-4 years. Other equipment may also have to be replaced. An estimate for the total costs however is 5-7 euros per kg of spirulina. The main costs involved in the local production of Spirulina are labour, nutrients, packaging, capital and administration. The costs of course depend on the local availability of materials. In india for example, the cost of building a tank of 18m2 is 166 euro and a feeding programme here produces Spirulina at a cost of 0.01euro per child per day. Spirulina programs are currently being implemented in Burkina Faso, Cameroon, Central African Republic, Democratic Republic of Congo, Guinea Conakry, Kenya, Madagascar, Mali, Niger, India, and Vietnam. 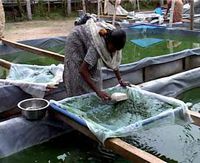 One example of a successful business initiative revolving around Spirulina production can be seen in Madurai, India. Here 15 women run a production facility of 40 Spirulina tanks. They work to produce 150kg of Spirulina per month.